What is Linkshare for iOS Developers? Linkshare is a way for you to make some EXTRA money from your app sales! As you know, for each app sold, Apple will take 30% and you will take 70%. With Linkshare, you will get an extra 4-5%! Want that extra 4-5%? Read on! I was trying to find a step by step tutorial for joining the affiliate program of iTunes/App Store via LinkShare.com, but couldn't find any (most of them are dead links and some requires you to buy their e-book). I have successfully registered with them, activated the account with email confirmation (just click a link in the email that they sent after completing the registration forms). Then I was stuck. Not sure where to begin. Took me a few hours to figure things out, so I'd like to share this tutorial, especially for international developers who would like to implement Affiliate program with LinkShare. 1. Apply For the iTunes / App Store Program within LinkShare.com. a) At the top menu bar, there is a PROGRAM button. Click on it. b) A list of Categories will show up. At the right hand corner, there is a search field. Search for "iTunes". c) The iTunes/App Store Program will show up and click Apply button at the end column. d) Wait for 1-2 weeks for the application process by LinkShare/Apple. They will review your website and so on. e) It just took me about 3 days to be approved by Apple/LinkShare. Awesome. So next, what we do is click on the My Advertisers tab under the Programs section. Then go ahead and click the iTunes & App Store link listed there. g) This will bring you to the iTunes Link Maker tool (hosted by Apple). Use the BULK function, whereby you can paste multi links of your apps into the text area and all will be converted to the Affiliate links at once. h) As you will notice, the affiliate link is a very long one. 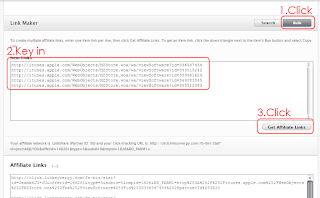 You can just use it like that, or you can also use shortening URL services such as http://bit.ly. Bit.ly is some sort of a redirect service. It keeps your URL short. For example is this link to my app iHueSplash. There you go. That is all there is to it. Pretty simple really. 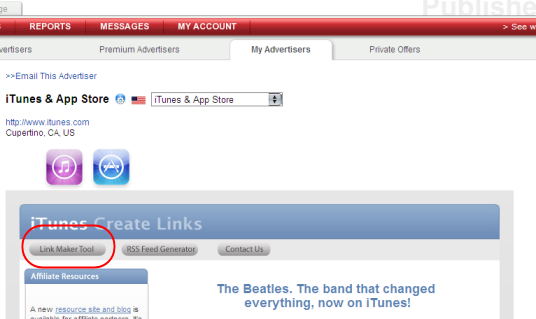 But wait, how to use these URLS/iTunes Affiliate Links? As for me, I put it in my signature of forums post, I use it in my website too. Also, I even use it in my apps (where user tap the links to get a Pro version and so on). You can also put it in Links that you post to promote your app in iPhone Apps Review sites/forums. BUT (here is a big BUT), do not ever use these URLs posted in your Press Release. PRMac, specifically are against this, and I believe so does other press release. Redirects are not good for Press Releases. You will be getting somewhere around 4-5% of your app sales from this affiliate. Not much really. But hey, it's still money isn't it? If you have any questions, just shout in the comments box. Hi GWesley, thanks for your comment.